WASHINGTON, April 17, 2017 — Pioneering insurance-fraud attorney Matthew Smith has been named associate director of government affairs for the Coalition Against Insurance Fraud. Smith will help guide the Coalition’s legislative and regulatory advocacy efforts as well as serve as general counsel. 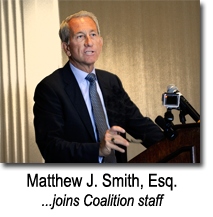 Smith founded one of the nation’s largest law firms specializing in insurance-fraud litigation. Cincinnati-based Smith Rolfes & Skavdahl has eight offices throughout the midwest and Florida. The firm’s lawyers have handled insurance matters in 43 states. Smith Rolfes broke new ground by specializing on all aspects of insurer defense against insurance fraud, from investigations to civil actions. He has won more than 100 civil actions including cases against home and commercial insurance arsonists, chiropractors that fraudulently overbill, pill mills, MRI clinics and other insurance swindlers. Many appellate decisions have set significant court precedents. Smith also pioneered using data from cell towers as evidence in civil insurance-fraud cases — now standard practice for insurance-fraud cases around the U.S. He also pioneered searches of social-media to gather evidence of suspected fraud. Smith Rolfes was founded in 1989. Smith now serves as of-counsel, focusing on government work with the Coalition and other fraud-related work. He has served as president or on boards and committees of numerous anti-fraud groups such as the International Association of SIUs ... National Society of Professional Insurance Investigators ... and International Association of Arson Investigators. A prolific author and lecturer, Smith has written more than a 100 articles and is a sought-after presenter by anti-fraud and civic groups. Smith has served as legal adviser to the Coalition for the last three years. He led efforts to file amici actions to help ensure state courts properly interpret anti-fraud statutes. Before founding Smith Skavdahl, Smith was at attorney at two other law firms and general counsel at a South Florida real-estate firm. An Ohio native, Smith graduated from Northern Kentucky University School of Law. He received his undergrad degree from the University of Cincinnati.